How do you like such type of tournaments like armfights? You already know your opponent in Vendetta, what do you know about him? a class act on the table and I have a ton of respect for him. Have you already started preparing for the fight? – I was preparing for Dmitry long before this match was announced. I kind of anticipated pulling him so I wanted to be as prepared as possible. You can never be too ready for this match. I will come in as pretty much the same weight I have for the past 4 years since I have stayed in the super heavyweight category. I'll be around 270-275 lbs (123-125 kg). – Yes, I already have studied my opponent. I've watched numerous matches of him. Over and over again. That is part of my training. I visualize myself in my matches against Dmitry. How I'm going to start, in certain positions and how the match will end in my mind. Then I have my training partners help me with his technique. Also working on my endurance for this fight. 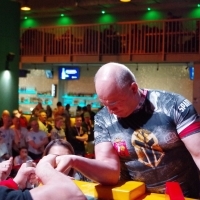 I will get advice from some of the very best in the armwrestling world as well. This fight will be very difficult. Dmitry is one of the best in the world and he has wins over the very best. He will be 40 lbs heavier than me and is a lot younger. So on paper I would seem to be the underdog, which I like being. Just like I was in 2013 when I came over and pulled Denis. I am going to leave everything I have on the table. I think this match will be a war. Do you plan to participate in the Zloty Tur? – I do not plan on pulling the Zloty tournament. I will need all the energy possible to compete against Dmitry. Daniel Procopciuc: "I bet on the Europeans"
Dmitry Trubin: "You will see what I can oppose to Dave"